Brexit reflected perhaps the biggest vote of no confidence in the political establishment in modern British history. Despite the vote leading to shock and dismay across the globe, this backlash against the political elite had been decades in the making. But how did we get here? 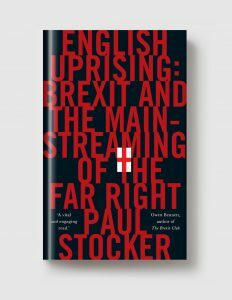 In his timely and important book, Paul Stocker examines how ideas of the far right—always a fringe movement in Britain—have become part of the cultural and political mainstream, especially via a noxious right-wing press, and how these issues are not unique to Britain. Rather, the growth of far-right populism is a Western phenomenon, and one with trends that can be witnessed across Europe, as well as the US. Ultimately, “mainstreaming” this racism has combined with populism—a growing sense that the political elite does not understand or represent the needs of ordinary Britons—which culminated in Brexit. PAUL STOCKER has a doctorate in British far-right history from Teesside University. Based at the Centre for Fascist, Anti-Fascist and Post-Fascist Studies, he has published research on the history of far-right and fascist movements in Britain from the 1920s until the 1960s. He lives in London. This is his first book.